Buildcore recently worked at a property in Caringbah, Sutherland Shire, or better known as ‘The Shire’. 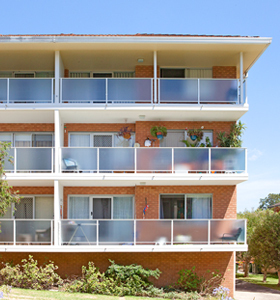 The strata owners committee noticed gaps between the existing 40 year old balustrades and the walls where they attach, creating a safety risk and non-compliance with building codes. Instead of continuing with ‘patch up jobs’, they decided a total balustrade replacement was overdue. They brought in an engineer to assess the property then sourced quotes from builders. They decided to go ahead with Buildcore Constructions because the quote was thorough with a high level of details, and this provided them with confidence. Buildcore’s Director, Mark Granger, reviewed the building and provided the strata owners committee with the most suitable product options. Lots of meetings were held to ensure all owners were informed and understood the process prior to construction. Once work commenced, weekly on-site meetings were held to kept residents up to date on progress and to address any unforeseen issues, like asbestos, which they found in the slabs. Although this delayed the work due to additional safety measures required, the Buildcore team kept the project moving forward. Strata owners committee member, Jackie, said she couldn’t fault Mark. Since replacing the balustrades, she said they have not looked back.